- To support Maharashtra Government’s vision to promote e-mobility in the State. 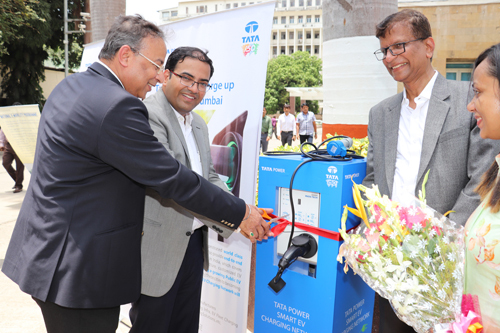 - Tata Power launches nine new EV charging stations in Mumbai. Tata Motors Limited has signed a Memorandum of Understanding (MoU) with the Government of Maharashtra to support the Maharashtra Electric Vehicle Policy (2018) in accelerating the adoption of Electric Vehicles in Maharashtra. Tata Power has partnered with Tata Motors in this endeavour to establish Electric Vehicle Charging Stations in the State for public use. Shri Devendra Fadnavis, Hon’ble Chief Minister of Maharashtra, inaugurated the new EV charging stations recently. The nine new locations where the EV charging stations have come up include Matunga, BKC, Bhandup (near LBS Marg), Chembur, Malad (near Link Road) and Carnac Bundar (near Fort and Freeway). Tata Power plans to device a mix of fast and regular chargers at these charging stations that will facilitate to charge vehicles from both private and public realms of life. The chargers can also monitor the car battery charging status and units consumed while charging a car. - Bhandup (near LBS Marg). - Malad (near Link Road). - Carnac Bundar (near Freeway and Fort). - Borivali (near Western Express Highway). - Mankhurd (on Vashi Highway). - ITC Grand Central, Parel. - Vikhroli (Mumbai’s first EV charging station). - Palladium Mall, Lower Parel.